Improv Cincinnati at Clifton Performance Theatre presents an evening of interactive improv comedy. New Recruit - Improv Cincinnati’s Executive Director Jon Ulrich performs an entire improvised set with a special guest. It could be you! 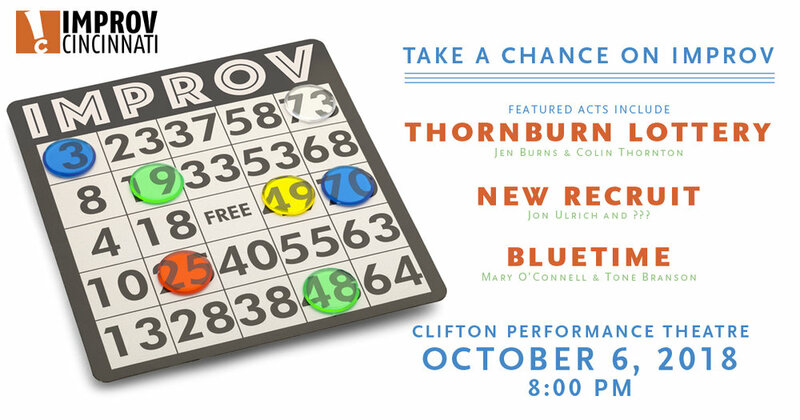 The ThornBurn Lottery - Colin Thornton and Jen Burns perform characters that are fun, energetic, and playful. This time they will be joined by an Improv Cincinnati student chosen randomly from a lottery. Blue Time - Tone Branson and Mary O’Connell create two worlds and slip between them like Gwenyth Paltrow in Sliders.